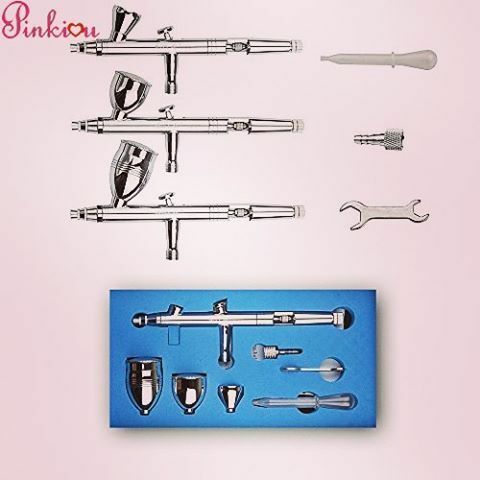 Pinkiou- The Professional Airbrush Permanent Tattoo Makeup Brand / Press Center / How To Apply Airbrush Makeup? For a long time now the secrets of air brushing has been held very close to heart by those special few but times are changing now. With the advent HD in every sphere of life, it’s time for the secrets to hit the streets too. Technology has in a lot of ways made life harder, I must say. A HD image magnifies the image about 6 times! And no makeup artist has the time to check their work under a magnifying glass before every appearance their models make. So came about the power of the air brush make up as a blending tool to give a uniform result. And boy isn’t it a spell binding solution. The result is you, but just a more sculpted and gorgeous version of you! 1.Airbrush Makeup method is very largely used in filming industry, because the spraying method gives a very natural look to the face, showing it clean and clear. However, if you ever notice in HD videos, because of traditional makeup a lot of pores and wrinkles on the face are visible. 2.Air brush Makeup features formulas for blush, foundation, lips, and eyebrows etc that offer perfect look. One can layer and shade the skin too. This method also offers sanitation owing to its feature that requires no need to touch the skin. 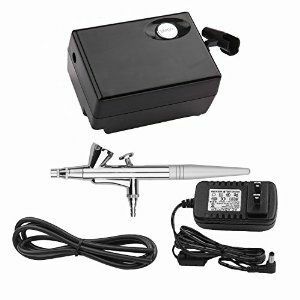 Air brush systems for makeup are designs that are smaller diaphragm compressors with less powerful and affordable. They have a have two needles that rest in the nozzle which the user maneuvers. The action happens when air and the pigments meet. One needle pushes out air and the other pigment. A single action nozzle is when the user just sprays out the mixture and a double action is where the user can control the amount of pigment that is released. This allows him great control over the results he/ she wants at the end. Let’s also have a sneak peak at the different types of formulas that are available. So how should you apply airbrush makeup? 1. Airbrush method can be done best when it is done by someone else, even though you can do it yourself. This is to avoid any chances of makeup getting into your eyes, which could cause problems. So it’s better to ask someone else to do it for you. 2. Doing this type of makeup is different from conventional makeup, so read up the manuals or watch CD’s provided by the company for good knowledge of the product and equipment. 3. Remember unlike traditional makeup, it can be layered without creating any problems. But for this to happen, leave the first layer to dry and reapply when it is dry. 4. While it’s easy to correct mistakes in traditional makeup, it is a bit of a problem to do the same in airbrush makeup. So use little bits of makeup each time so that you don’t need to over apply. This is very important for blushes and highlights amongst others. 5. Practice on a piece of paper or anyone else to get an idea as to how you can apply. You can also otherwise test it on paper beforehand to assess the technique better. 6. Practice mixing the shades too as these will create the best looks. 7. 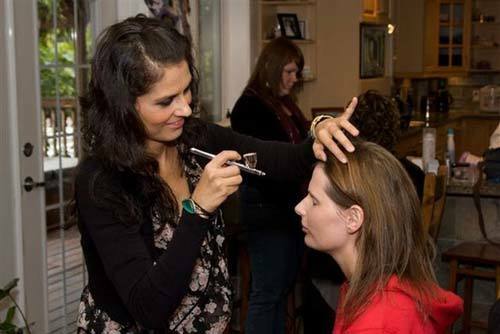 The best way to apply airbrush makeup is to apply it from a distance of six inches from the face. Use small bursts of makeup on selected areas for better control. When you have practiced more you can easily do layers and use regular bursts for a quicker finish. 8. Use circular or forward backward motion for applying the makeup. 9. 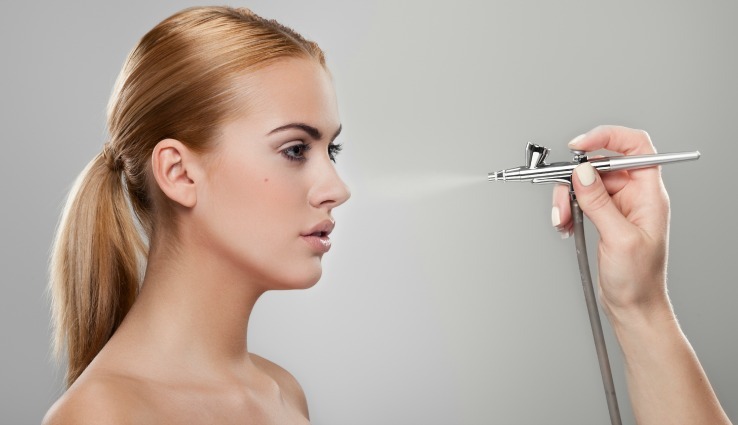 There are many types of airbrush makeup like water based, polymer-water based, alcohol based, and silicone based as mentioned above. Choose the best one for your skin type. 10. Consult a reputed makeup artist for better suggestions. And now for the dirty little secret tips that have been hidden from us for all these years. Don’t mix up the formula’s. Like alcohol and silicon don’t dry at the same pace! Train yourself in measurements to avoid wastage.